When it was time for the “most capable midsize truck ever,” the all-new 2020 Jeep Gladiator, to show off its prowess, the all-new pickup didn’t miss the mark. The Gladiator headed to the King of the Hammers Desert Off-road race and competed in this year’s Every Man Challenge in Johnson Valley, California, during the week of February 1 to February 9, 2019. Savvy Off-Road, an aftermarket parts shop from Corona, California, was responsible for preparing the Gladiator for the competition, and they brought their best game and expertise as evidenced by their overall wins at five consecutive Every Man Challenges from 2012 – 2016, and again last year (2018). Driving duties were in the hands of legendary racing driver Robby Gordon – he boasts a decades-long racing career in the desert, IndyCar, NASCAR, and many other road racing series, and Erik Miller – a two-time King of the Hammers champion. Gordon handled the high-speed portions of the race course, while Miller was tasked with making the Gladiator shine with its unmatched off-road capabilities in a famed section of the Hammers trails. All vehicles competing in the King of Hammers Every Man Challenge must adhere to strict rules. They are required to have a factory engine, a single shock at each wheel, 35-inch tires, and their stock frame and body. Powering the 2020 Gladiator under the hood is an award-winning 3.6-liter Pentastar V6 engine capable of generating 285 horsepower and 260 lb-ft of torque and is mated to a standard six-speed manual transmission or an optional eight-speed automatic. After 26 years, the Gladiator is the latest in tough and dependable Jeep trucks with a body-in-frame design. The Gladiator features an all-new high-strength steel frame and relies on modern engineering to be lightweight, yet stiff and durable. Savvy Off-Road crafted a custom link-and-coil suspension with Fox remote reservoir shocks for the competition. They also added Dynatrac 60 front and rear axles, a winch, a safety cage, and beadlock wheels with 35-inch Falken Wildpeak M/T tires. 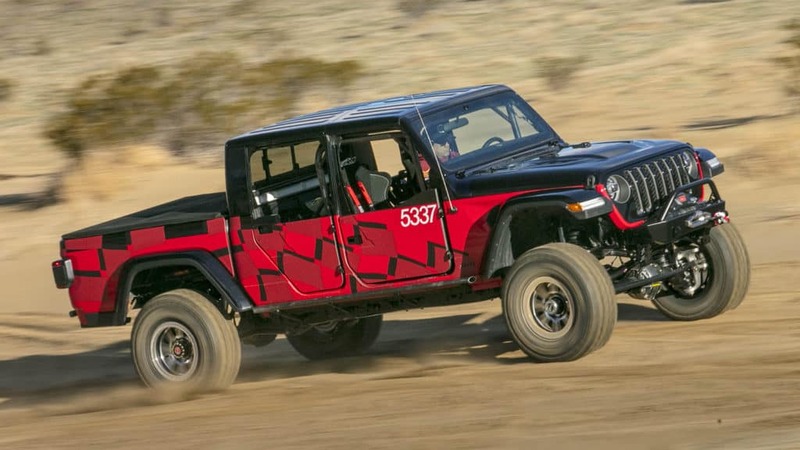 The Gladiator Rubicon’s “Radical Red” interior remains mostly unchanged, only the rear seats have been removed and Sparco racing seats have been added in the front of the cabin. Explore the all-new 2020 Gladiator and follow Hollywood Chrysler Jeep on social media to know when the most capable midsize truck ever makes its way across our dealer lot.